All my favorite bloggers are posting pumpkin things. I also want to eat all the pumpkin things. So, as I'm sure you're wondering, why add another pumpkin recipe to the already-pumpkin-overloaded-interwebs? Well, I happen to think this particular pumpkin recipe is a keeper. I found it five years ago and have been making it every October since without fail. This is a healthy-ish version of pumpkin bread made with whole wheat flour, less sugar, and less fat than most recipes. I also seem to add or substitute one ingredient for another every time that I make it, but it always turns out well. This time I substituted healthier olive oil for the canola oil and added in some superfood flax seeds into the streusel topping. This recipe makes 2 loaves, which I like. I usually keep one for us and give the other one away. This weekend, I gave the other loaf to a friend's parents who were hosting us for the weekend. They LOVED it. In fact, her mom called the pumpkin bread "the highlight of the weekend." Told you it was a keeper. This bread is not overly sweet. If you've got a sweet tooth, you could add additional sugar, or do as we did and smear a slice with some honey walnut cream cheese. YUM! Prepare 2 nine-inch loaf pans with non-stick spray. In a medium bowl, whisk together flours, sugars, baking soda, baking powder, salt, and spices. In a large bowl, combine pumpkin puree, milk eggs, olive oil, and vanilla extract. Pour batter into loaf pans and bake at 350 for 35 minutes. When there are about 10 minutes left on the timer, start the streusel topping. In a small bowl, combine oats, flax seeds, sugar, flour, salt, and cinnamon. Using a pastry blender or 2 knives, cut the cold butter into the mixture until it is crumbly. Remove the loaves from the oven. Sprinkle evenly with streusel and bake for another 35 minutes or until inserted toothpick comes out clean. Let cool for 10 minutes before removing from pans. I am going to make this next weekend as a gift for a friend of mine who just started a gluten free diet. I will let you know how it works with almond flour. Fantastic! Yes, let me know how it turns out and I will add a footnote to the recipe! I love pumpkin bread! This just looks so hearty and delicious! Can one ever have TOO MANY pumpkin recipes? I choose not to think so. 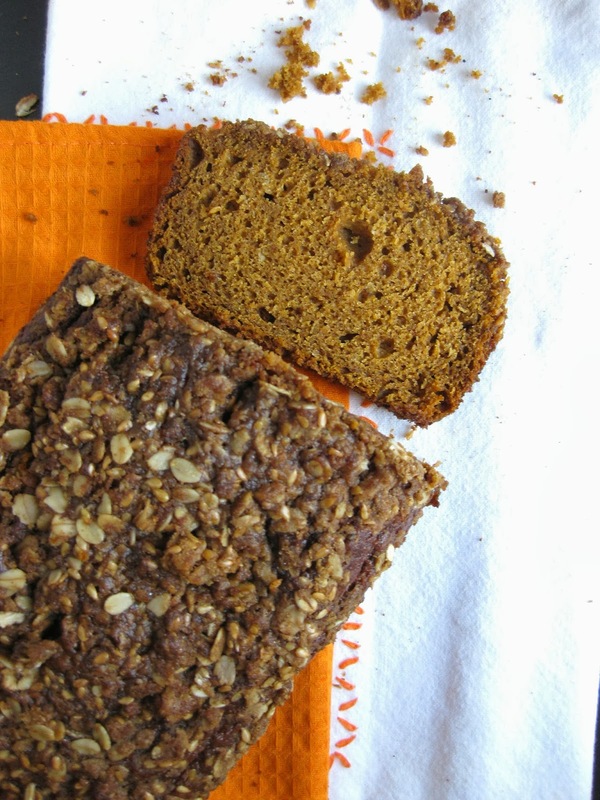 LOVE this healthier pumpkin bread! Totally adding this to my fall rotation!